Are you looking to get your kids more involved in household chores? I took the middle sections out of our Swiffer Sweeper to make it child-sized, and now Emma sweeps the floor for me every morning! Simple things like adapting cleaning supplies to make them more child-friendly goes a long ways towards getting kids involved with household chores! We also use child-friendly cleaners – vinegar, baking soda, and dish soap are three standards in our home! How do you get your kids involved with household chores? Update 2/20/2015: Each of my four kids has enjoyed doing this over the years; two-year-old Anna is now my resident floor cleaner! 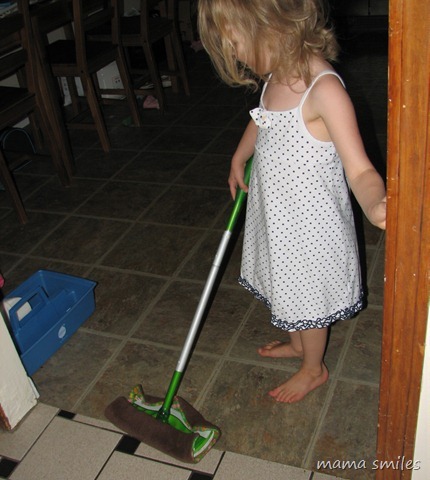 I have also written a new post full of great tips for getting kids to help with chores. Hi thanks for popping over. .-= twolittleseeds´s last blog ..Our Sun Cake =-. That’s a great idea! My daughters have a play mop and broom they use to pretend clean… now I can just adapt the Swiffer and truly put them to work! .-= Quadmama´s last blog ..Sunscreen =-. Great idea! They usually try and sweep with the full-size one and end up poking or knocking something…will have to give this a try! My two lil girls are so fascinated with Swifters. They love to help me dust using their swifter sticks. I got two for the both of them because they were fighting over it some time ago. .-= Jackie @ 3 Little Ones´s last blog ..A Bad Day =-. Brilliant! I should have thought of taking out a piece! They can still work it but I’m sure they’ll be less frustrated! .-= Andrea @ The Train To Crazy´s last blog ..A floral Fathers’ Day =-. This is a great idea! Jack LOVES to use our Swiffers. I am def. going to do this for one of them just for him. Thank you!! Hey, say a little prayer for me. I have an interview tomorrow night with our Bishopric about a calling–no idea what it is. Nervous:-)…. .-= susana´s last blog ..Southwest Pizza with that awesome crust recipe =-. Even Sam has started in on the action. He just kind of moves the dirt around, though. Cute idea. Maybe I should shorten mine, too. Yea for an enthusiastic helper and a clever mama to make a Swifter just-her-size! :) We have an usher broom and dustpan set that works almost equally well for adults and children. My kids’ favourite use of the broom is to fetch things out from under the sofa and refrigerator. The area beneath our refrigerator is surprisingly dust-bunny-free these days. .-= Elisa | blissfulE´s last blog ..learning to read and write =-. My children are fans of our dustpan and brush, but I think your idea would be a real winner with them (and me). I have often wondered when the enthusiasm for helping to clean dies off. Hair gel and food coloring is a combination we have not tried. After seeing your blog post and cool pictures for this activity I think we will also have a heap of fun with this. No sew felt food. My interest really piqued when I saw the “no sew” part. Your pizzas are fantastic and I will certainly be whipping up a few of these. My children are right into playing with pretend food at the moment and I think they would appreciate some new additions to their collection. .-= Elise´s last blog ..Upcycling The Humble Toilet Roll =-. Wow! I am so going to have to do that!!! .-= Terra´s last blog ..Preschool Plans – Week of June 28th =-. .-= Natalie´s last blog ..Science Sunday – Touch =-.